Author/s : Paul Groenewegen, MSc - Technical Manager - Alltech Canada, Inc. Profitable pork production is determined by a magnitude of parameters. Not always is the lowest cost or highest performance operations the most profitable. Factors such as management, genetics, hygiene and nutrition have all changed dramatically over the past few decades, however, as in all technologies, opportunities for improvement still exist. From a nutritional perspective, great strides have been made in the fields of amino acid, energy and vitamin research. However, trace mineral research, utilizing our highly productive animals, in many cases is lacking and the nutritional requirements we are following to feed our animals today are often decades old. Ask yourself “Are our pigs today the same as they were 20 years ago?” The answer is no. Unfortunately, the trace mineral requirements we are using to feed our advanced genetics are in many cases based on research that is 20 years old (NRC, 1998). As an example of advancements made in research, both at the university and commercial levels, let’s consider the essential nutrient selenium. While originally considered a toxic substance, selenium is now known to be an essential nutrient that promotes a healthy immune system and acts as a key element in the antioxidant system (Surai, 2006). By definition, trace minerals are supplied in very small quantities and in the case of selenium the maximum level allowed in rations is 0.3 ppm. Today’s advanced genetics, large scale production units and demanding financial requirements have elevated the need for our pigs to have an improved health status and greater ability to fight off disease. Maximizing the animals natural defense mechanisms will result in optimal performance and costs. Selenium plays a key role in the maintenance of good health, and research is beginning to differentiate between forms of selenium. Recent findings show that the organic form of selenium, as found in Se enriched yeast, provides not only improved animal performance but reduced costs as well. Preliminary research on performance differences between Se-yeast (Sel-Plex®, Alltech®) and inorganic selenium (sodium selenite) sources was conducted at Iowa State University in the mid 1990’s (Mahan and Kim, 1996). This research showed that Se-yeast was more effective in increasing selenium reserves in the body, transferring selenium to the fetus, at birth and at weaning. During times of stress, the body’s requirement for antioxidants increases (Fortier and Matte, 2005) and, since birth and weaning are extremely stressful periods in a pig’s life, the use of an ingredient such as Se-yeast may be beneficial during gestation and lactation to enhance the storage of this essential nutrient. Essential dietary nutrients, such as selenium, are to be provided in the animal’s diet on a daily basis for the maintenance of good health. However, during times of stress feed intake is often reduced for prolonged periods of time, thus reducing the intake of these essential nutrients. Utilizing ingredients such as Se-yeast that are proven to increase tissue stores of selenium (Mahan and Parrett, 1996; Mahan and Kim, 1996; Mahan et.al., 1999) for later utilization in the antioxidant protection system may be warranted. Normal metabolism within any animal produces toxic by-products (oxygen free radicals). These free radicals require a strong antioxidant protection system to neutralize them, or severe damage will occur to the tissues leading to reduced performance or even death. Think of it as an engine. Small, low horsepower engines produce less exhaust than do large, high performance engines. The swine genetics of today are high performance engines, utilizing optimal diets (fuel) to grow, reproduce and convert feed efficiently in to the pork you produce. However, this “high performance engine” also produces more exhaust (oxygen free radicals) that require an advanced antioxidant protection system to neutralize productive disorders such as low viability in piglets, reduced growth rate, prolonged farrowing interval, increased stillbirths, lower disease resistance, Mulberry Heart disease and lower reproductive performance may occur (Jacques, 2001). Ever wonder why, in your production units, the fastest growing, highest intake, best pig in the pens quietly lies down and dies? Apparently nothing was wrong with the pig except it is now dead. While many diseases could be the culprit, so too could be a borderline selenium deficiency that limited the animals natural defense mechanisms (antioxidant protection system) from “mopping up” the excess “exhaust” (oxygen free radicals). Considering the metabolic events occurring in our pigs on a daily basis and the fact that a more metabolically active animal places higher demands on its antioxidant protection system was investigated recently by Canadian researchers. This study investigated the effect of Se-yeast compared to inorganic selenium on the antioxidant protection system in the ovary and eventually the embryos. The results of this experiment showed that Se-yeast, not sodium selenite, was the only source of selenium that was able to cope with the high oxidative pressures seen in the ovary (Fortier and Matte, 2005). The researcher then concluded that in hyperprolific-type sows Se-yeast would be critical for the efficient transfer of selenium to the embryos and in the subsequent development in early gestation (Fortier and Matte, 2005). Another way Se-yeast is proving to be the selenium supplementation of choice for swine rations. Considering all the research finds on the positive effects of Se-yeast on swine performance, researchers in Iowa decided to put Se-yeast to the test under commercial conditions. They conducted a 2 part experiment, involving over 1,650 sows, to evaluate the impact of Se-yeast on sow reproductive performance (Lampe et.al., 2005a, b, Gourley et.al., 2006). The results were clear. Under commercial conditions, today’s highly prolific sows weaned more pigs (0.22 pigs/litter weaned, 0.15 pigs/litter reduced pre-wean mortality) when Se-yeast was used as the sole source of selenium supplementation compared to inorganic selenium (Hooge, 2006). The economic impact of this improvement in reproductive performance is significant. Hooge, 2006 reported a return on investment of 7:1 when Se-yeast was used in place of inorganic selenium to supplement sow rations. Further calculations show that when Se-yeast is used in place of inorganic selenium and, considering these production improvements, sow feed cost per piglet weaned is reduced. Se-yeast, not inorganic selenium, reduces the cost of production. Is that not the goal of modern, profitable swine production…to reduce the cost of production while optimizing performance? Current production and management practices have enabled the selection of hyperprolific swine genetics that may have outgrown components of our current feeding recommendations. Today’s high producing animals require advanced plains of nutrition and inorganic sources of selenium may not be sufficient to deliver the optimal performance and best cost of production. Research is continually evolving and the transfer of “university data” to commercial application has proven to be economically viable, especially in the case of Se-yeast versus inorganic selenium in sow reproduction rations. Based on the compelling research data, Se-yeast is the recommended choice for selenium supplementation in swine lactation and gestation rations. 1. Fortier, M.E. and J.J. Matte. 2005. 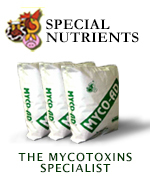 In: Nutritional Biotechnology in the Feed and Food Industry. Proceedings of Alltech’s 21st Annual Feed Industry Symposium. Nottingham University Press, Nottingham, U.K. pp175-184. 3. Hooge, D.M. 2006. Dietary organic selenium may be benefit sow and pre-wean pigs. Feedstuffs. Volume 78, Issue 26. June 26, 2006. 4. Jacques K.A. 2001. Selenium metabolism in animals: relationship between dietary selenium form and physiological response. Science and Technology in the Feed Industry. Proceedings of Alltech’s 17th Annual Symposium. pp 319-348. 5. Lampe, J., G. Gourley, J. Sparks and T. Stumpf. 2005a. Prewean piglet survivability:Sel-Plex® versus sodium selenite as selenium sources in sow and nursery phase diets. J Anim. Sci. 83(Suppl. 2):51. 6. Lampe, J., G. Gourley, J. Sparks and T. Stumpf. 2005b. Postwean piglet survivability:Sel-Plex® versus sodium selenite as selenium sources in sow and nursery phase diets. J Anim. Sci. 83(Suppl. 2):51. 7. Mahan, D.C. and Y.Y. Kim. 1996. Effect of inorganic or organic selenium at two dietary levels on reproductive performance and tissue selenium concentration in first-parity gilts and their progeny. J Anim. Sci. 74:2711-2718. 8. Mahan, D.C. and N.A. Parrett. 1996. Evaluating the efficiency of selenium enriched yeast and sodium selenite on tissue Se concentration and serum GSH-Px activity in grower and finisher swine. J. Anim. Sci. 74:2967-2974. 9. Mahan, D.C., T.R. Cline and B. Richert. 1999. Effects of dietary levels of selenium-enriched yeast and sodium selenite as selenium sources fed to growing-finishing pigs on performance, tissue selenium, serum glutathione peroxidase activity, carcass characteristics and loin quality. J. Anim. Sci. 77:2172-2179. 10. National Research Council. Nutrient requirements of Swine. 1998. Tenth Revised Edition. National Academic Press. Washington D.C.
11. Surai, P.F. 2006. Selenium in Nutrition and Health. Nottingham University Press, Nottingham, U.K., pp. 445-486.